Replace your Garmin Nuvi 2597LMT Battery or Keep an Extra Battery on hand as a backup. This kit comes with an Extended Capacity 1200 mAh, Lithium-Ion Battery that offers up even more up time than your original. Works in your Garmin Nuvi 2597LMT unit. Simple, Easy and Inexpensive! 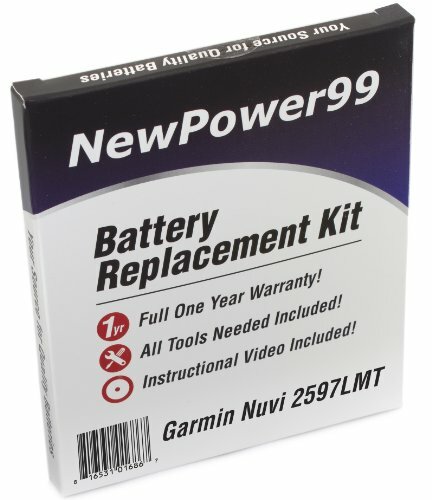 You get a New Battery, FREE Tools (necessary for installation), Video Instructions AND You also get a full ONE YEAR Money Back Guarantee exclusively when you purchase Innovate88's Garmin Nuvi 2597LMT Battery Replacement Kit. Battery Replacement Kit for Garmin Nuvi 1490 with Installation Video, Tools, and Extended Life Battery. Battery Replacement Kit for Garmin Nuvi 2595LM with Installation Video, Tools, and Extended Life Battery.